Download this list to hang on your refrigerator, over your desk – wherever you need reminders and support. Stay motivated. Make a list of reasons to quit and carry the list with you. Revisit these reasons when you have the urge to smoke. Set a date. 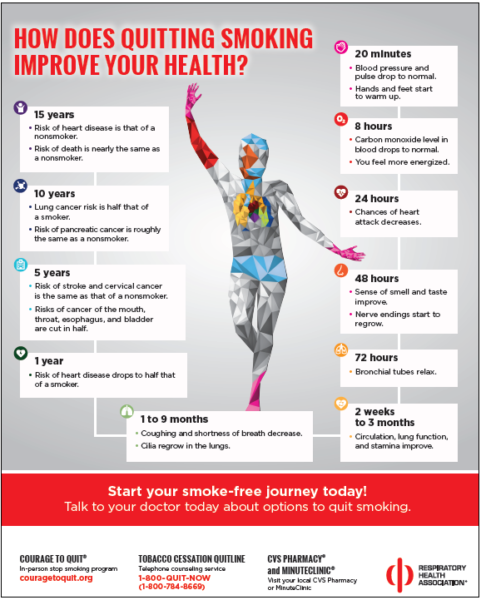 Quitting smoking is one of the most important health decisions a person can make, but it takes work and commitment. Setting a quit date in advance and making preparations is key to starting a new, smoke-free life. Remove evidence of cigarettes. To get smoking out of your life, clean out your car, wash your clothes, put away your ashtrays, and get rid of all your cigarettes. Keeping cigarettes or lighters “just in case” undermines your self-confidence. Change your routine. Cut smoke breaks out of your life and remove temptations by changing your routine as much as possible. For example, sit in a different place at the kitchen table, take a new route to work or drink tea instead of coffee. Reward yourself for not smoking. Set short and long term goals, and reward yourself for each milestone you reach. Making a “contract” with yourself or a friend can help you stay resolved. Drink more water. When you have the urge to smoke, drinking water can combat the craving and get your mind off of smoking. Also avoid alcohol and caffeine, which are common triggers for people who smoke. Plan ahead for temptation. Eat frequent, small meals to stabilize your blood sugar levels. Keep substitutes (such as carrots, raisins, gum, hard candy and lollipops) handy to keep your hands and mouth busy. You can also keep your hands busy by carrying a stress ball, a doodle pad or a pack of cards. Get moving. When a craving hits, get up and go for a walk, do some push-ups or call a friend. Staying active will keep your mind off of smoking until the craving passes. Find support. Be proactive about spending time with non-smokers and/or ex-smokers. Plan non-smoking strategies before you go to events where other people might be smoking. Don’t be discouraged. Many former smokers tried to stop several times before they finally succeeded. If you give in to a craving, don’t let it get you down. Examine what went wrong, learn from what happened and quit again! 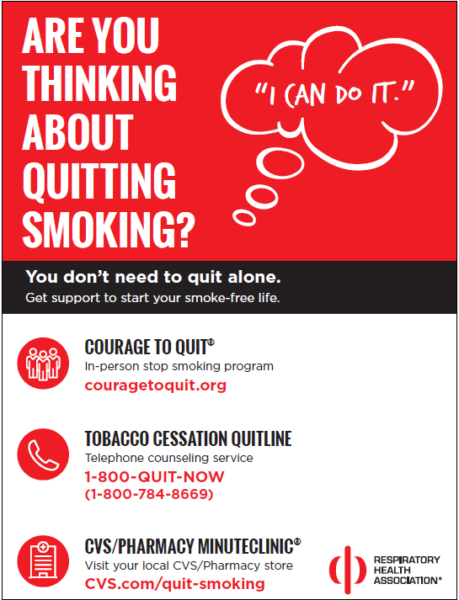 RHA’s Courage to Quit® is our adult tobacco cessation program based on smoking treatments outlined in the U.S. Public Health Service Clinical Practice Guideline (Fiore et al., 2008). 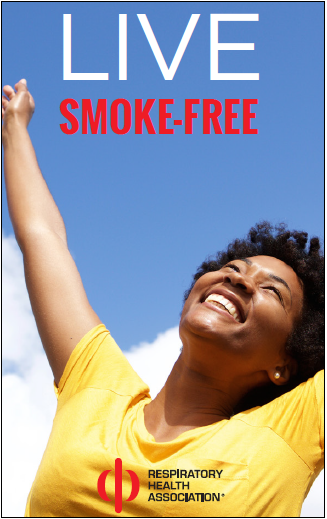 It offers information, skills-building, and support to help you achieve your smoke-free goals. BecomeAnEx.org is a free, online program that helps you re-learn life without cigarettes through a personalized quit plan and support from other smokers and ex-smokers. Tobacco Quitlines are telephone-based tobacco cessation services staffed by trained counselors who can provide information about quitting and work with you to develop a customized quit smoking plan. Contact your state tobacco quitline by calling 1-800-QUIT-NOW. Contact the Illinois Tobacco Quitline at 1-866-QUIT-YES. For more information about other tobacco products, stop smoking medications and a host of other topics related to tobacco use, visit the Quit Smoking section of our Library.